My outdoor experience began in high school with a canoeing/camping group which made a 10-day voyage through the Quebec wilds. I've been backpacking since my college days in Pennsylvania. I have hiked all of the Appalachian Trail in Georgia, Tennessee and North Carolina. My typical trip now is in the Sierra Nevada in California and is from a few days to a few weeks long. Over the past few years I have lowered my pack weight to a lightweight base weight of 15 lb (6.8 kg) and use a tent, stove and quilt. The Big Agnes Pumphouse sack is a multi-use dry sack and sleeping pad pump made of a lightweight Cordura fabric to resist abrasion, tears and scratches. It can also be used as a shower, a pillow or a water carrier. The size is similar to a small or medium stuff sack of other brands that I own. Dimensions are 19.5 in (49.5 cm) long with a 12 in (30.5 cm) opening tapering to 8 in (20.3 cm) at the bottom. The top has a dry bag-type of roll-top closure with a buckle to secure it. There is a nozzle shaped section on the bottom with a drawstring closure and cord-lock. This is the section that fits over the valve on my sleeping pad. Overall this sack has spent approximately 70 days on the trail. All trips have been in California with most being in the Sierra Nevada. Trips ranged from three to 21 days with mostly clear conditions. Some examples of my trips include the following. John Muir Trail, Sierra Nevada, California: 21 days; 225 mi (362 km); 4,035 ft to 14,496 ft (1,230 to 4,418 m); 35 to 80 F (2 to 27 C); mostly clear with several days of showers and one torrential downpour from afternoon into the overnight. Yosemite National Park, Sierra Nevada, California: 5 days; 37 mi (60 km); 4,200 to 9,400 ft (1,280 to 2,865 m); 45 to 75 F (7 to 24 C) with clear conditions. Sylvia Lake, Desolation Wilderness, California: 3 days; 20 mi (32 km); 6,700 to 9,983 ft (2,042 to 3,043 m) elevation; 25 to 65 F (-4 to 18 C) with clear to partly cloudy conditions. Pacific Crest Trail, California: 8 days; 78 mi (126 km); 7,519 to 10,870 ft (2,292 to 3,313 m) elevation; 37 to 75 F (3 to 24 C) with clear to partly cloudy conditions. Hetch Hetchy, Yosemite National Park, California: 4 days; 32 mi (52 km); 3,900 to 7,400 ft (1,189 to 2,256 m); 35 to 70 F (2 to 21 C) with clear conditions. Emigrant Wilderness, Sierra Nevada, California: 4 days; 24 miles (39 km); 7,160 to 8,930 ft (2,182 to 2,722 m); 55 to 85 F (13 to 29 C) with clear to cloudy conditions. Now, I like gear that has multiple uses! Although I have to admit that I haven't used the Pumphouse as a shower or water carrier since I don't want to worry about it being wet when I need to load in clothing. I did, however, turn it inside out, fill it with water and hang it over my kitchen sink to see how well it would hold just to give me confidence that it would keep my clothing dry. I don't use pack covers or pack liners but rather prefer to keep my clothing in one dry sack and my quilt in another. This way I keep my critical items dry without the hassle and weight of other rain protection options. The Pumphouse has done well to keep our clothing dry in my pack. I use the Pumphouse as a dry sack to carry all of the extra clothing for me and my husband. We can easily fit our down jackets, extra socks and undergarments, sleeping clothes and pillows into the Pumphouse. I usually store raingear elsewhere in our packs so that it is easily accessible but at times it goes in here too since there usually is plenty of room. The size is pretty much perfect for us since I can fit inside of it both of our clothing needs even for colder trips. But for shorter or warmer trips, the sack isn't so oversized that it feels excessive. I can always roll the top down to fit the load just right and expel any excess air. The loaded sack makes a solid base for packing my backpack and so it ends up on the bottom. Then when we get to camp, the Pumphouse comes out along with all of its contents so that our down jackets can fluff up and to divide our clothing onto the correct sides of the tent for finding it later when we're tired. I then usually use the Pumphouse to inflate my sleeping pad. It takes longer for me to use the Pumphouse to inflate my pad than it takes for me to blow it up and certainly longer than it takes my husband to blow it up, but I still find it to be useful. At higher elevations I get headaches and nausea and blowing up a pad seems to trigger problems even if I was previously feeling fine. My husband often blows mine up for me but I can always use the Pumphouse to save my head. 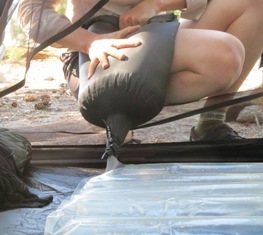 To inflate a pad I simply open the drawstring and place the nozzle over the opened sleeping pad valve and then cinch it down. The stuff sack is now secure to the pad so I can move things around without it falling off. I then open the large end of the stuff sack and try to trap as much air inside as I can. Then I roll the end enough to close it and push out the air into my pad. It takes 15 -20 of these actions depending on which pad I am using and how good I am at trapping a lot of air. I don't really mind doing it so I haven't made it a goal to reduce this number although I'm sure it could be done more quickly with a better technique. We usually backpack in areas where bear canisters are required and we often take them even when they aren't required just to keep the bears safe and to keep the rodents out of our food. However, there have been trips where we don't carry a canister at which times we use the multi-purpose Pumphouse to hang our food overnight. Durability has been great with the sack still looking and working like new. There have been no issues with wear, abrasions or tearing despite use on at least 15 backpacking trips for a total of over 70 days. I can't recall washing it, but I'm sure that I have hand-washed it at some time. Regardless, there is no odor and it doesn't appear to be dirty. Overall I really like the Pumphouse and take it on nearly every trip. Actually, I can't think of a trip where I haven't taken it since I got it in 2012.